Did you know that an estimate of 48.9 million people currently have a disability in the United States? That’s a lot of people, people who may have ideas to give, talents to offer, and spirit to contribute to our society. There have been many assistive technology acts since 1988 to create and provide devices that help perform tasks that would otherwise be difficult or impossible for that large and vibrant community. Assistive technology for people with disabilities has opened doors to many who may want to pursue careers that would have otherwise been difficult, and has created a competitive athletic driven disability community. It has enabled the education system the opportunity to offer more and more students with disabilities the chances that they deserve. What is known as the, “Tech Act,” was first created in 1988, and reauthorized in 1994 and again in 1998. The legislation was passed to create access for people with disabilities in addition to the availability of devices. The legislation’s goals gave the state funding to make all of this possible, along with national initiatives. Big changes came to the legislation in 2004, instead of focusing on states building the systems to provide these critical resources; the act now required the state to provide direct aid to improve their quality of living. The Tech Acts have come a long way, just like the vast variety of options of assistive technology. There is so much out there in what we have built to make the world an easier place to live in, and there is still a lot more coming in the future. That is why NTI wants you to know there is so much out there for you to assist you in achieving your goals. We are here to help you in finding a job, getting training for a career, and changing your life for the better. We believing in providing access to the job, just like the Tech Act provides access to help people do things they may not be able to do. Visit us at NTICentral.org. Change your life with a job, just like assistive technology improved the world. Recently, Mark Bos, the Team USA Helmsman competed in the 2016 Blind Match Race World Cup Championship and returned back to NTI. He stated that he had a wonderful time at the event. There was lots of great competition, learning for everyone involved, and most of all progression in the sail blind internationally. Of course in any event of this magnitude there was times of thrilling success and times of what seemed to be insurmountable obstacles. It can be best depicted by the age old phrase of The World of Sports; "The Wild World of Sports...The thrill of victory and the agony of defeat". My team had some thrilling races in which we gained in overall ranking, and skill/knowledge. There were also times of what appeared to be horrible defeats in which the US Team again gained more skill and knowledge. Had time periods, due to uncontrollable weather conditions, that we were presented an excellent opportunity to obtain and share skills, techniques with other International Blind Match Race teams and with the Women's World Match Race Teams as well. It was awesome to have this opportunity that was made available by the incredible individuals who directed and managed the event. The whole community in Sheboygan, Wisconsin was wonderfully supportive of all events and participants. There were numerous occasions when the US team would be leaving a restaurant and had the honor of everybody standing up from their tables cheering, "Go USA". Individuals and businesses went out of their way to graciously host all teams and provide support with supplies and finances. Unfortunately, on the 1st race during the final day of competition, USA Team needed to withdraw from the event. This was due to a failure in good communication on the boat and a drastic unpredictable weather pattern change which led to a significant medical injury to myself. I was struck on the head (fortunately with a helmet on) by the boom of the sailboat. The impact was so loud that people on the course thought it was a collision between 2 boats. At the request of team officials, my teammate and coach, paramedics, and my mother who had just arrived, I agreed to be transported to a local hospital for evaluation and withdraw from the race. After being evaluated at the hospital it was determined that I had a minor concussion, a definite pulled muscle in my neck and pre-seizure activity. It should be noted that if I did not have a helmet these injuries would have been much greater. So of course we did not medal in the event. However, I have been strongly promoting that all Blind Sailors wear helmets for the last 2 years. When the US Team was practicing in Sheboygan in July, I was the only US team member who wore a helmet at that time. There was one blind sailor during this practice that obtained a concussion and 4 stitches, who still did not wear a helmet the next day in practice. As it can be seen by this actual situation and by many others there was great resistance in Blind Sailors wearing helmets. My victory which was far greater than winning the gold medal, even though that would have complemented it well, was that all Blind Sailors from both USA Teams wore helmets. I was also able to set up a campaign with one of the young women from the Woman's World Cup Swedish teams to promote all sailors in any event to wear helmets. She being one of the only professional sailors at this rank to wear a helmet in almost all events she participates in. This is due to her getting a severe concussion from the sail boom of the boat she was racing that forced her off the race circuit for a full year. 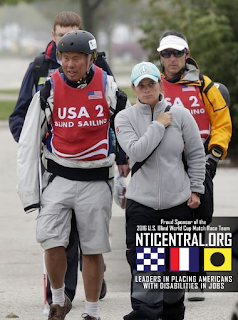 At NTI, we wish Mark a speedy recovery and special thank you for all of his efforts in supporting Team USA and his personal victory in instilling safety in the world of Blind Sailing. We look forward to seeing his efforts in the future and sailing once again. Mark Bos is the Helmsman for the USA Team in Blind Match Racing. When he isn’t sailing, he works as a Recruiter for NTI helping Americans with Disabilities back into the workplace. By trade, Mark is adventurous and also uses his musical skills as a drummer in a band. With a nothing stops him, type of mentality, Mark keeps showing the world what he can do. Happy 43rd Anniversary, Section 504! 43 years ago today, on September 26, 1973, Section 504 of the Rehabilitation Act came to pass. Overall, the Rehabilitation Act provides funding for research and activities that have to do with disabilities. However, it also contains three sections that prohibit discrimination against Americans with disabilities by employers. Section 504 is one of those sections. It is often discussed in the area of protecting school children with disabilities from discrimination, and including them in regular classrooms, but here we’re talking about the employment part of the section. It works to prohibit discrimination by federal agencies, or by programs/activities that receive federal funding or are put on by a federal agency, against individuals with disabilities who are applying for jobs or working with the program/activity. Plus, it specifically states that federal agencies must work to positively assist Americans with disabilities. In the case of employment, that means taking reasonable steps to accommodate the individual’s disability in the workplace. Fog threatened the start of the World Sailing Blind Match Racing World Championship, which was supposed to set sail on Wednesday. Postponed to today, NTI's, Mark Bos and Team USA will square off against Great Britain. Mark stated, that the Blind Racing League instituted a new rule to keep the playing field even, Specifically, Mark said the league now "requires Helmsman wear a blindfold or blacked out wrap-around sunglasses." He was able to practice this for the first time on Tuesday, but felt extremely confident. He went on to say, "In the past I did use light dark and the sun for position awareness which is no longer possible due to total black, but we'll adjust." However, even though there was a delay of the race, it didn't stop Team USA from participating in a the opening ceremony which included Dave Perry being awarded one of the highest Lions Club Awards. Mark stated that "it has been great the trade sailing tips, stories and great camaraderie with some of the best National Women's Match race sellers, some of which placed a medal in the Olympics as well as Paralympics. Once the race is underway, we'll continue our coverage and updates. In the meantime, NTI and our followers continue to wish Mark and Team USA the best of luck in the competition. When Paralympian Alana Nichols, of Farmington, New Mexico, was 17, she loved snowboarding and would spend as much time as she could on the slopes. However, one day, she attempted a backflip on her snowboard, but landed on her back on a rock and became paralyzed from the waist down. Nichols continued to pursue her interest in sports, moving on to wheelchair basketball and alpine skiing. Her skills on the slopes took her to the top, as she first competed in the 2009 US Paralympics Alpine Skiing National Championships ; the 2013 WorldCups in St. Moritz and Sestriere for the giant slalom; the 2014 US Paralympics Alpine Skiing National Championships; and the Paralympic Games in 2008 and 2012 for wheelchair basketball and 2010 and 2014 for the giant slalom. However, at the Paralympic Games in Sochi in 2014, she had a scary crash, resulting in a dislocated jaw and concussion. She did overcome those injuries to go on to compete at the end of those Paralympic Games, but that was the end of her winter Paralympic endeavors. Nichols turned to the water, discovering how much she loved to surf and spend time in a canoe and kayak. She competed in and won adaptive surfing competitions as well as the 2016 ICF Paracanoe World Championship, placing 8th overall in the KL2 Women’s 200m. 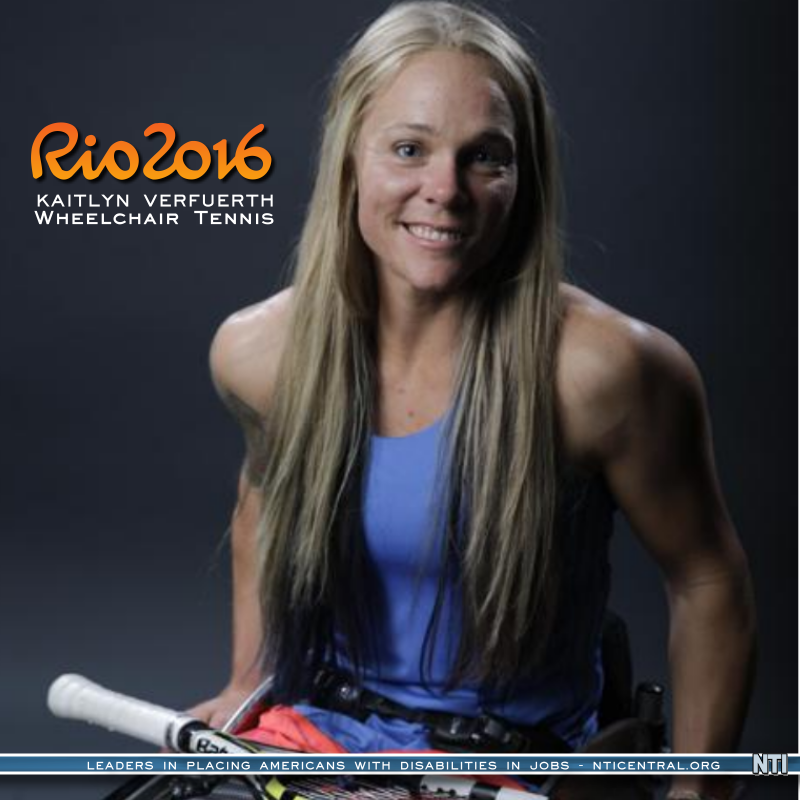 At Rio, Nichols will be competing in the Paracanoe - Women’s KL2 event, and we wish her the best! Have you been involved with sports in the past and wondered how you could continue to do so post-disability? Americans with disabilities can still go skiing, surf, play basketball or kayak, as the 2016 Paralympians have truly shown. As a young girl, Sydney Collier’s dreams were of competing as an equestrian in the Rolex Kentucky Three-Day Event. But then her mother took her in for a routine eye exam when Sydney was seven years old. At the appointment, they were told that Sydney needed glasses. That would have been the end of it, but instead of ordering glasses, Sydney’s mother took her to an ophthalmologist instead, who discovered something behind Sydney’s right eye. That “something” was a tumor caused by Wyburn-Mason syndrome, which is a very rare condition in which the veins and arteries within a person’s brain don’t separate with capillaries as they typically do. The syndrome causes a tumor deep in the brain and often it isn’t detected until after people die from a massive bleed in their brain. Sydney went on to undergo a number of hospitalizations and medical treatments for the Wyburn-Mason Syndrome. However, she still lost full vision in her right eye; is half-blind in her left eye and had a stroke that left her paralyzed on her left side. Her constant companion is her service dog, Journey, who acts as Sydney’s cane by walking alongside her. After meeting Paralympian equestrian Jonathan Wentz, Sydney started training to become a para-equestrian. This is her first Paralympics Games and she will be competing as both an individual equestrian and as part of a team with Wesley Dunham’s Western Rose. At just 17 years of age, Lauryn DeLuca from Parma, Ohio is competing in her first Paralympics for Wheelchair Fencing. 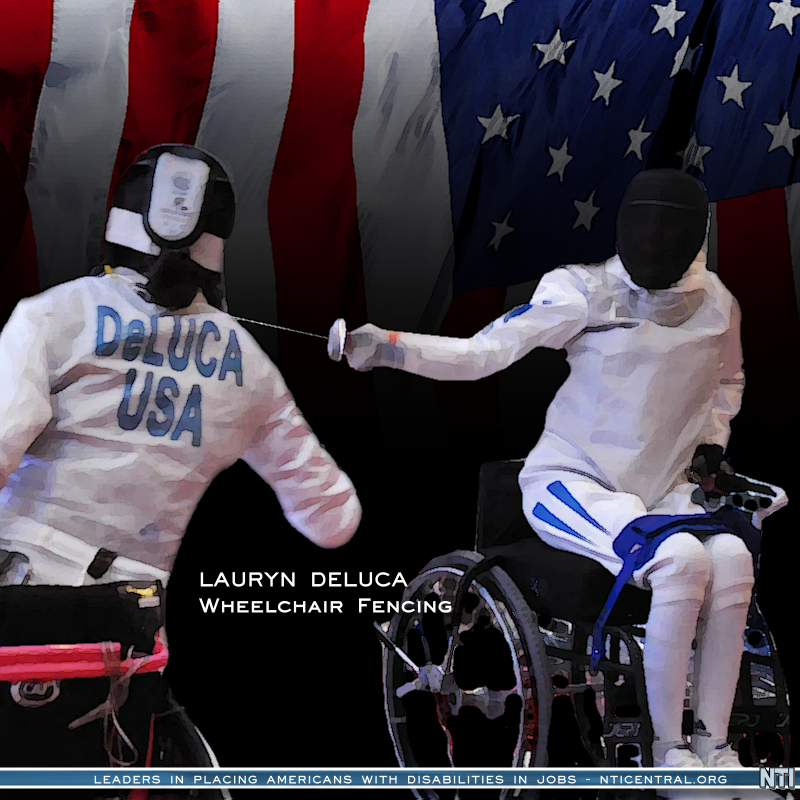 If that isn’t amazing and awe-inspiring enough, DeLuca is the only wheelchair fencer from Team USA competing in Rio. 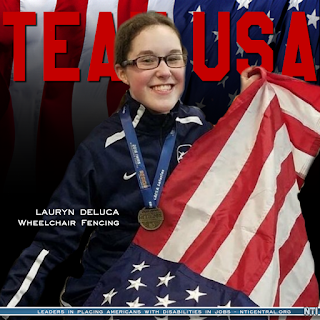 Bring home the gold, Lauryn! 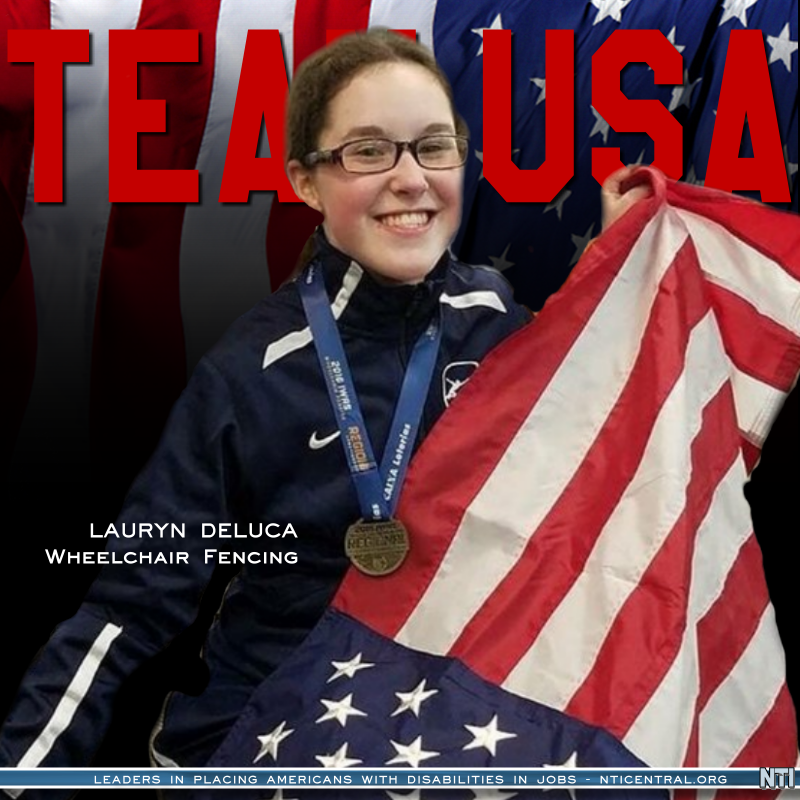 After the Paralympics, DeLuca will return to Parma High School as a junior with her twin sister, Olivya. Both Lauryn and Olivya are percussionists for the marching band at Parma High. Think about where you were at age 17. Were you competing in the Paralympics? I know I wasn’t. Instead, I was a very shy high school senior who completely kept to herself. I’ve grown past that now and overcome my social anxiety to be outgoing when I need to be and talk to people I don’t know with ease. If you also have some challenges you need to overcome, we’d like to talk to you, especially if one of those is being an American with disabilities who wants to work. Get in touch and see what we can do to help you follow your dreams. Dedication is far from a foreign concept to any athlete who is training towards a goal. Countless hours of practice, eating the right foods, and staying consistent with a workout schedule are all very crucial to lead an athlete towards success. Now consider a Paralympic athlete's dedication. It may take an individual with a disability twice as long or twice as much muscle power to complete the same task that someone without a disability would take. 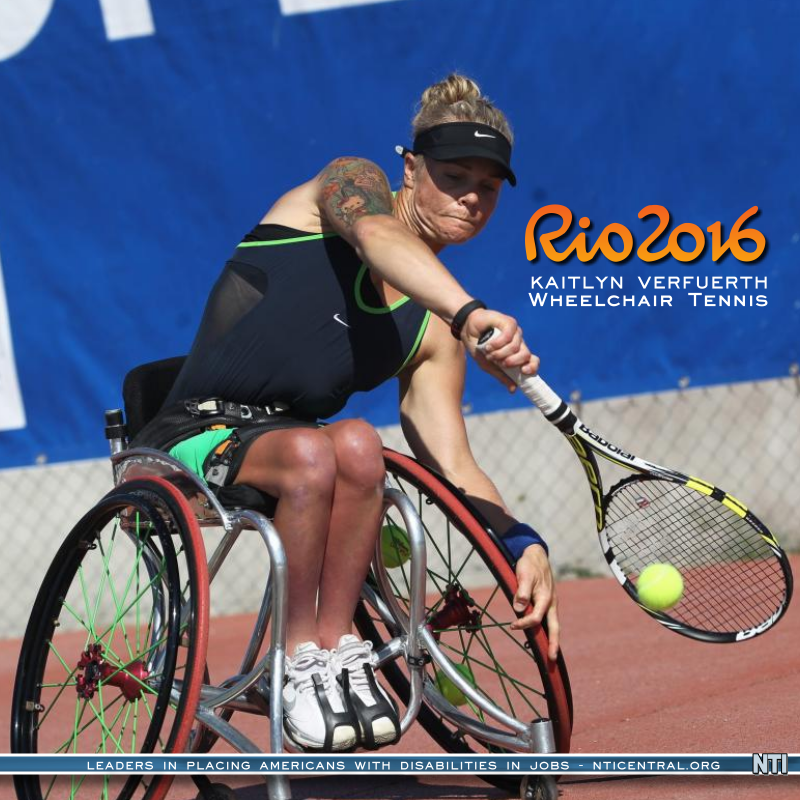 Success in any sport takes dedication, but success in a Paralympic sport is – quite literally – a whole different ball game. It is this attitude that fostered her success as a college athlete, earning the title of 2015 Challenged Athlete of the Year at UCSD, and a spot in the San Diego Hall of Champions. She made her college debut as a freshman competing in meets, and has been a crucial component of the team ever since. She is currently a junior at UCSD, and has qualified for the 2016 Paralympic Games in Rio, where she has already set two personal bests in the first two of the four races in which she will compete. 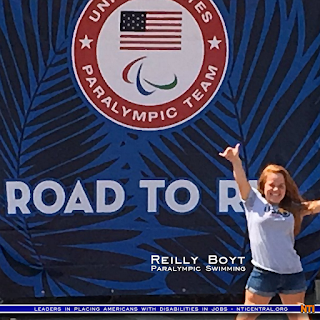 We're excited to follow the rest of Reilly's journey as she proudly represents Team USA, and also admire her hard work and great execution as she swims her way to her dream. There aren’t many athletes out there like Cornelius Oatis, who can land one leather ball on top of the other upon throwing it. His sport is called Boccia, derived from the Italian sport bocci, and is played by people with disabilities on a gymnasium floor. Oatis’ drive, motivation, and most importantly, his precision has made him a world champion. Oatis stated, “All people with cerebral palsy are not alike. When you hear the word, don’t let it scare you away. Find out about it before you judge.” It doesn’t matter that Oatis is in a motorized chair, a result of his cerebral palsy, he plays to win. Oatis and his boccia duo partner, Marek Harrison, have made it far, and made it together. They not only conquered the sport, but they also fundraised to help them get to Worlds, the London Paralympics, and now Rio. None of that was an easy feat. Little did Oatis know about how true his words rang out for the future. NTI wants to invest in your future. We want to remind you that anything is possible if you are motivated and driven enough to go for it like Cornelius Oatis. So if you are on SSI or SSDI, and are passionate about getting yourself back into the workforce, reach out to us! You can find us at nticentral.org. 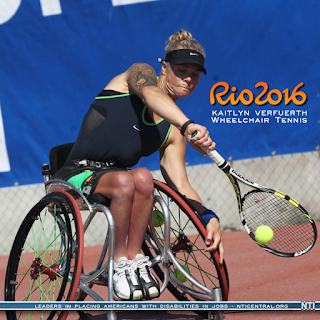 Every single Paralympian competing in the 2016 Rio Paralympic Games has a story to tell of determination, challenges, and a will to succeed. 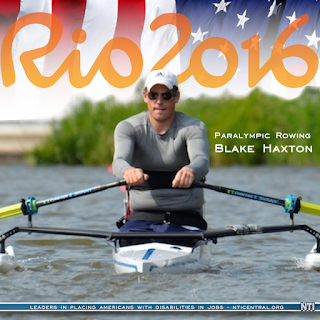 Competitive rower Blake Haxton from Columbus, OH has his own story and defines the word “determination”. Back in high school, Haxton was a very successful rower. He loved the sport and has a strong competitive streak that enhanced his love of rowing. However, in spring of his senior year, Haxton developed necrotizing fasciitis, which is a flesh-eating bacteria. Due to the resulting complications from the infection, both of his legs were amputated. Even after the amputation, Haxton remained strongly interested in rowing, knowing that his upper body strength was what was necessary for the sport, and he set about training. 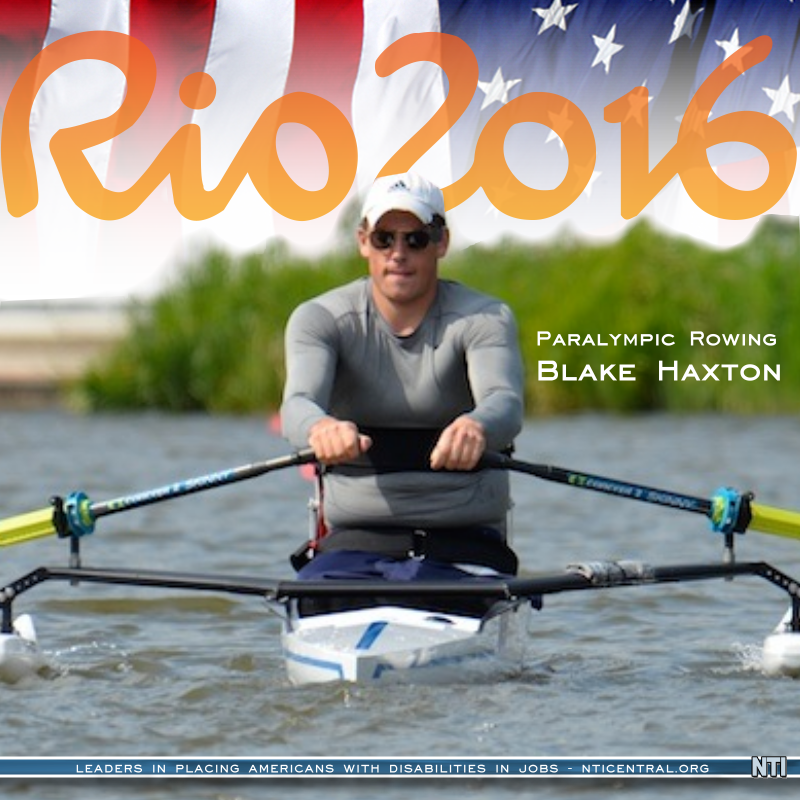 This is Haxton’s first year in the Paralympics and he is competing in the Men’s Arms and Shoulders Single Sculls.